Q: What the hell is Caddlesnaw? In small towns, you think you know people. You don't. 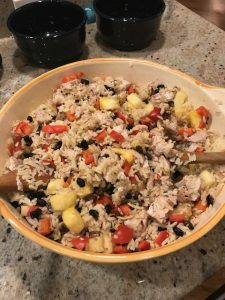 A: Rice, black beans, red pepper, pineapple and chicken = caddlesnaw. Oh, you’ve never heard that word? It popped into my head when my wife first made this dish many years ago. And so caddlesnaw entered my small inventory of nonsensical words that usually can be used interchangeably, depending on the situation. Another is “hodo,” which can mean a lot of things but frequently is used as a stand-in forthe verb “go.” Yes, I know this is borderline insane, but apparently I have passed it on to my children, who have concocted a larger store of functional non-words. It strikes me that I don’t think I’ve ever used a nonsense word in one of my novels. I will have to correct that. Meantime, I do love me some caddlesnaw.